Grays Reef Passage serves as the primary route between the Straits and the ports on the southern shores of Lake Michigan. Bounded on the east by Vienna Shoal and East Shoal, Grays Reef itself forms the western boundary of the passage, and consists of an extensive area of shallow water over a rocky bottom stretching over eight miles in length. With some portions of its rocky bottom almost protruding above the water’s surface, the reef has long represented a significant threat to any vessel master unfamiliar with the intricacies of the passage. As traffic through the Straits burgeoned with increasing shipments of iron ore out of Lake Superior through the 1880’s, mariners began lobbying the Lighthouse Board to improve the lighting of a number of dangerous shoals in the Straits area. While the construction of manned light stations in such locations was preferred, the high costs associated with offshore construction made the anchoring of lightships over such obstructions a significantly more expeditious and cost effective solution. Responding to this need, the Lighthouse Board requested Congressional funding for the construction of three such vessels in the late 1880’s for deployment on White Shoal, Simmons Reef and Grays Reef. Congress responded on March 2, 1899 with an appropriation of $60,000. The Board submitted requests for quotation to a number of shipbuilders, with the contract ultimately awarded to the Blythe Craig Shipbuilding Co of Toledo, Ohio. Plans for the three identical 103-foot oak-planked vessels called for them to be equipped with a single screw driven by a small single cylinder steam engine. These engines were designed to provide the vessels with sufficient power to allow them to get on and off station under their own power. Thereby eliminating the costs associated with having a lighthouse tender moving them on and off station at the beginning and end of the navigation season. Work on the vessels was completed on September 15, 1891, and on delivery at the Detroit lighthouse depot they were officially designated with hull numbers LV55, LV56 and LV57. The three vessels departed the Lighthouse Depot under their own steam on October 19, and reaching Port Huron that same evening, were met by the lighthouse tender DAHLIA, which towed them north through Lake Huron and placed all three vessels on their stations on October 24th ,1891. With the exception of spending winters in Cheboygan Harbor, where she underwent annual maintenance during the annual ice-over, LV57 served on Grays Reef every shipping season for the following thirty-two years until her hull was found to be rotted beyond repair at winter lay-up in 1923, and she was immediately removed from service. 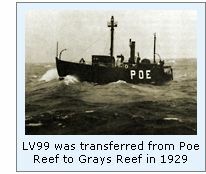 To replace the retiring vessel, LV103 was temporarily placed in Grays Reef at the opening of the 1924 navigation season. Built by the Consolidated Shipbuilding Corporation of Morris Heights New York, LV103 had been delivered to the District headquarters in Milwaukee on June, 1921, and had spent the past three years serving as a relief vessel throughout Lake Michigan. 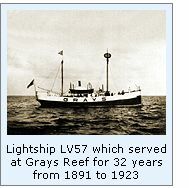 LV103 remained at Grays Reef until 1927, when LV56 was transferred-in on the opening of the navigation season. 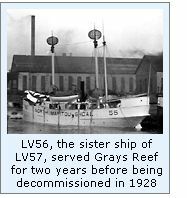 One of the two sister ships to LV56, from all appearances she had weathered the rigors of work on the lake better than her sister, and was still considered to be in serviceable condition. After commissioning in 1891, she had served at White Shoal until 1909, when she was reassigned to North Manitou Shoal after completion of construction of the White Shoal Light. However, the outward appearances of her seaworthiness were evidently misleading, as she too was found to be suffering from a considerable amount of hull deterioration, and was declared unseaworthy during her 1928-1929 winter lay-up in Cheboygan, and she too was removed from service. With construction of the new light at Poe Reef well underway, plans were put in place to relocate LV99 from Poe to Grays Reef upon the light station’s completion the following summer. 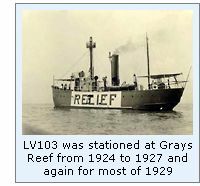 Thus relief vessel LV103 was once again temporarily stationed at Grays Reef at the beginning of the 1929 shipping season until she was replaced by LV99 that fall. LV99 was one of the newest of the Great Lakes lightships, and represented the current state of the art. Built in 1920 by Rice Brothers at Boothbay Harbor in Maine, she was steel-hulled, 92-feet in length, and was equipped with a single acetylene powered light, a ten-inch steam fog whistle and a submarine bell, which had been added to her arsenal of warning equipment in 1923. Since the construction of the first 350-foot long lock at the Soo in 1855, the size of the locks had served as the limiting factor for the length of commercial vessels able to move through them in and out of Lake Superior. Since larger vessels allowed larger loads, while still allowing for the same number of trips during the navigation season, ship owners were constantly clamoring for the construction of larger locks at the Soo, and a thirty year cycle of lock replacement began. With the opening of the twin 850-foot long Davis and Sabin locks in 1919, vessels quickly grew to previously unimagined dimensions, and the Army Corps of Engineers was pressed to ensure that all navigation channels throughout the lakes were improved to handle longer and deeper draft vessels. With many of the largest ore-carrying vessels making their way through Grays Reef Passage on their down-bound trip to the steel mills of southern Lake Michigan, the US Army Corps of Engineers were working in the Passage in the early 1930’s taking soundings in preparation to enlarging the two mile long passage to a width of 3,000 feet and a minimum depth of 25 feet, opening it up to the largest vessels of the time. As a result of improvements in offshore construction learned in the construction of the Lake Huron stations at Poe Reef, Martin Reef and Fourteen foot Shoal in the late 1920’s, the technology was in place and the time was right to finally replace the lightship on Grays Reef with a first class light station to guide mariners through the passage. After consulting with the Army Corps of Engineers and the Lake Carrier’s Association, the Lighthouse Service determined that the optimum location for the new station would be in 26 feet of water, 100 feet off a turn in the proposed channel, and slightly to the southeast of the existing lightship anchorage. Funding for the new station was approved by Congress on February 14, 1934, and plans and specifications were drawn up soon thereafter. The design of the steel lighthouse structure was a modification and enlargement of the F. P. Dillon and W. G. Will design being used for breakwater lights at Conneaut and Huron, and was an exact twin a new station to be established at Minneapolis Shoal. Bids for construction were advertised with a stipulated completion date of by July 1, 1936. The contract for the station’s construction was finally awarded to the Greiling Brothers Company, who had considerable experience in water-based construction including the erection of the breakwaters at Ludington and a large dock at Rogers City. With the arrival of Greiling and his crew in 1936, the skinning of the main building and tower was underway, and the inner walls lined with concrete block to both prevent condensation and provide insulation for the living quarters within. The mechanical room in the cellar extended up into the first floor of the building, and housed diesel powered generators to provide electrical power for the light and dwelling, compressors to power the Type F diaphone fog signal, and boilers for the hot water central heating system. The second floor made up the keepers quarters, and was replete with electric lighting and sanitary plumbing. Centered atop the main building, the 17-foot tall tower stood 16-feet square at the base, and after a graceful rolled flare, narrowed to 10-feet square beneath the gallery. The tower was topped by a circular lantern with helical astragals, and outfitted with an occulting red Third and a Half Order Fresnel lens. Illuminated by a 13,000 candlepower incandescent electric bulb, the bulb was outfitted with an automatic flasher mechanism with caused it to exhibit a repeated characteristic 4 seconds of light followed by 2 seconds of darkness. Seated at a focal plane of 82 feet, the light was visible for a distance of 17 miles in clear weather conditions. Greiling finished work on the station in September of 1936, two months behind the stipulated date, and considerably over budget. With the activation of the new light, LV99 was removed from her anchorage, the last in a long line of stalwart lightships to serve mariners in Lake Michigan’s treacherous northern waters. On May 3, 1937, a radio beacons was installed at the station, and its signal exactly synchronized with the diaphone fog signal. This synchronization allowed mariners to precisely calculate their distance from the station by measuring the time differential between receiving the radio signal and hearing the diaphone. With responsibility for the nation’s aids to navigation transferred to the Coast Guard in 1939, Coast Guard crews began manning the station as the civilian Lighthouse Service keepers retired. Advances in solar-powered systems in the 1970’s facilitated the automation of an increasing number of offshore lights, and the elimination of the high costs associated with keeping five-man crews supplied throughout the navigation season. Thus, in 1976 the lights at White Shoal, Lansing Shoal and Grays Reef were all automated, and the last crew to serve at the Grays Reef was removed. Today, Grays Reef’s light is provided by a 190 mm 12-volt dc solar-powered acrylic Tidelands Signal optic. Power generated by the photovoltaic panel during daylight hours is stored in a series of batteries for use at night, when the stations flashing red light still shines 15 miles across the lake to warn mariners of the western limit of the passage. The station now sits empty with the exception of infrequent visits by Coast Guard crews to conduct standard maintenance on the lighting system. The station is also "manned" for a couple of days every July, when with the permission of the Coast Guard, officials of the Chicago Yacht club use the station as an observation platform to monitor contestants making their way through Grays Reef passage during the annual Chicago to Mackinac yacht race. Click Here to see a complete listing of all Grays Reef Light keepers compiled by Phyllis L. Tag of Great Lakes Lighthouse Research.